Students, teachers, and parents took a Needs Assessment Survey for the Counseling Department from the middle of August into early September. We are excited to share the results with you! We split the results up below by survey so that you can easily compare the needs of students, parents, and teachers at Hopewell. Please check out our calendars at the bottom of this page to see what programs we are planning to meet some of the needs that were highlighted in the surveys. Thank you to all students, teachers, and parents who took the time to take our survey! Your input really helps shape our counseling programming at Hopewell! Academic Concerns: Parents, students, and teachers all indicated a need for help with study skills and organization. Teachers specifically identified that students need help with organization. The counselors will be running a study skills group to address all of these issues several times throughout the year. Counselors will also be meeting one-on-one with struggling students to help them gain skills to improve grades. We will also be working with students referred by teachers on organization. As a reminder, we do offer organization help every Thursday in the Media Center from 7:50-8:30. This is open to everyone and we are happy to help! College/Career Planning Concerns: Parents, students and teachers all expressed a desire for students to learn more about their career options and how to reach their career goals. Counselors will be delivering classroom guidance activities starting in January. Students will be completing activities on the Georgia Career and Information System's website. Check your grade level counselor's page or the calendars below for more information. We are also planning a parent seminar in February on Academic Pathways to educate parents on course options and how they fit in with college/career goals. 8th grade Career Day will take place on November 15th and will give students an opportunity to explore some of their career goals. 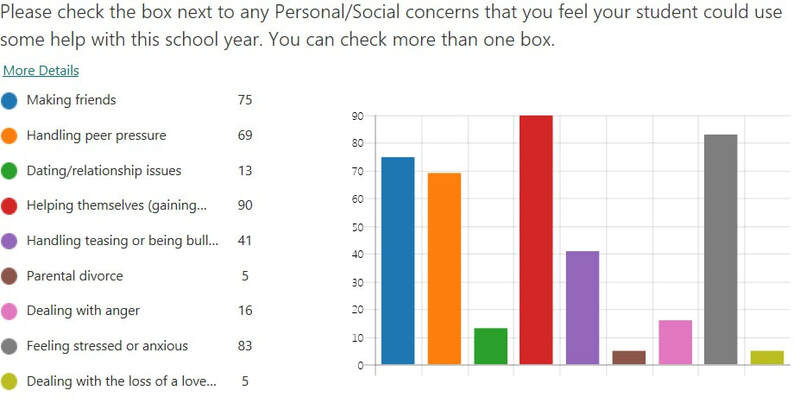 Personal/Social Concerns: Teachers and students indicated that their main concern was feeling stressed by a significant amount. This is the 4th year we've done our needs assessment and this is the second year that "feeling stressed" has surpassed other categories by a significant amount. 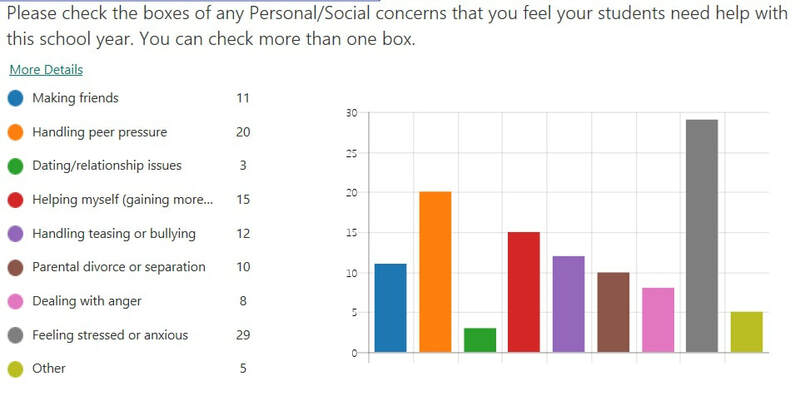 In response to these results, counselors will be offering academic tools to alleviate stress. Study skills groups will be offered throughout the year in addition to organizational help sessions. We will also be organizing our De-Stress Zones strategically around especially stressful times, such as finals. Parents indicated a need for helping their children "help themselves - learning to gain more self-confidence, feel better about themselves, and express their feelings and thoughts." The Counseling Department will be working with the PRIDE Committee to develop lessons to address these issues though PRIDE time as well as helping individual and small groups of targeted students that need assistance with this. These are just some of the activities that the counseling department has planned to address the needs that were indicated through the needs assessment surveys. Please take a look at our calendars below to see more detailed programming we have planned for the school year. Our department will also develop activities and programs to address needs that become apparent throughout the school year in addition to the programs listed below.